WordPress has a function of searching related posts to a blogger’s posting. This artist, only identified as Hilldowdy1, has produced a magnificent watercolor. Who is Hilldowdy1? The artist has several other watercolors online, but there is no information about him or her. After skimming through Hilldowdy1’s blog, I find out that the artist has traveled in Europe and been at the Chicago Institute of Art. Please link to Hilldowdy1’s blog by referring to her comment below. A very fine blog with paintings. 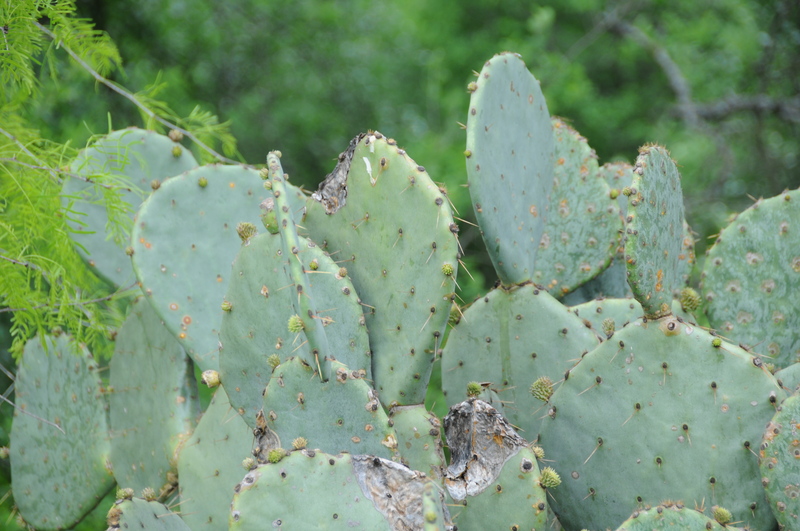 This is a common Prickly Pear in Texas, also known as Nopal Prickly Pear. There’s much about the cactus to be learned and applied in the world. The Texas Prickly Pear is found along fence rows especially on Flying Hat. I am letting larger stands of the Nopal Prickly Pear alone to thrive. Can’t do it all. I have to set up a list of priorities on our place. 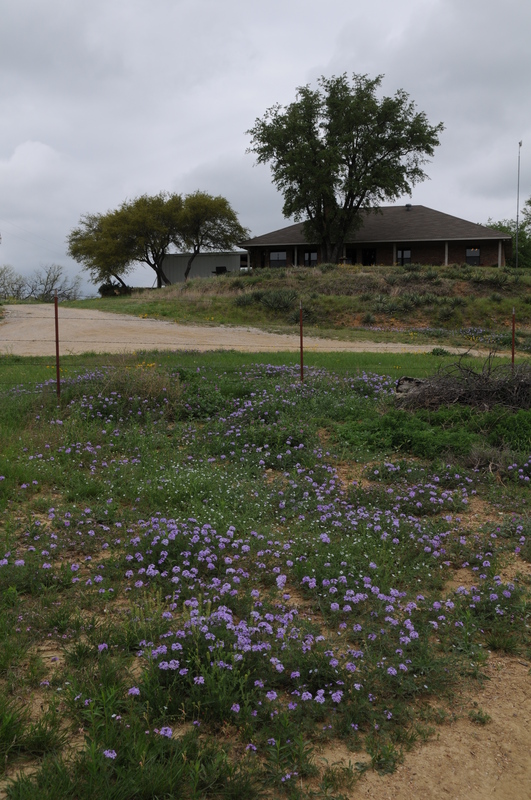 Mesquite control in the fields is my first priority, then comes the elimination of broomweed. On the other hand, I have a fondness for the Nopal Prickly Pear–it relaxes me to see a good stand of it with fruit. I’ve eaten the fruit in survival training and it’s okay. Not cantaloupe, but good enough. It’s soothing to see a healthy stand of Prickly Pear because it’s a sign that no pear-burning has occurred. And, pear-burning is a task to be avoided. 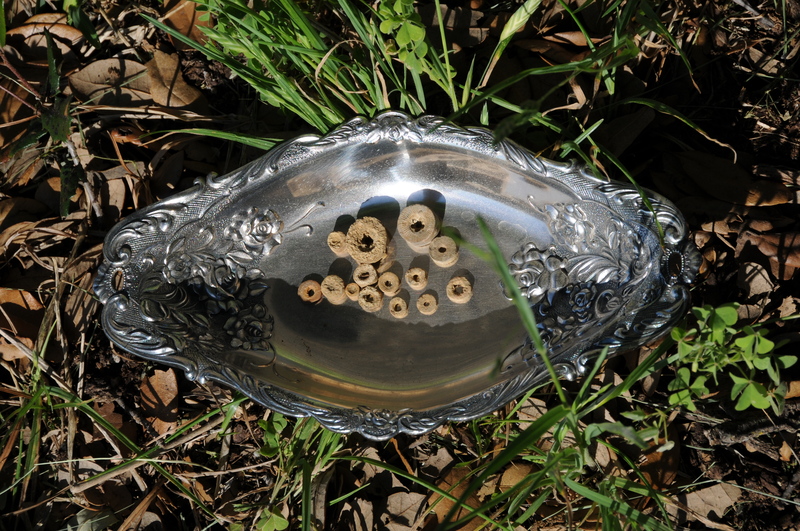 My family burned Nopal thorns off the cacti for cattle to eat de-thorned cactus pads (other varieties of cacti, too). My great-grandfather Henry Morris labored at such terrible work during the drought of the 1930s. For him and others, west of San Angelo, it was a hot, brutal job. 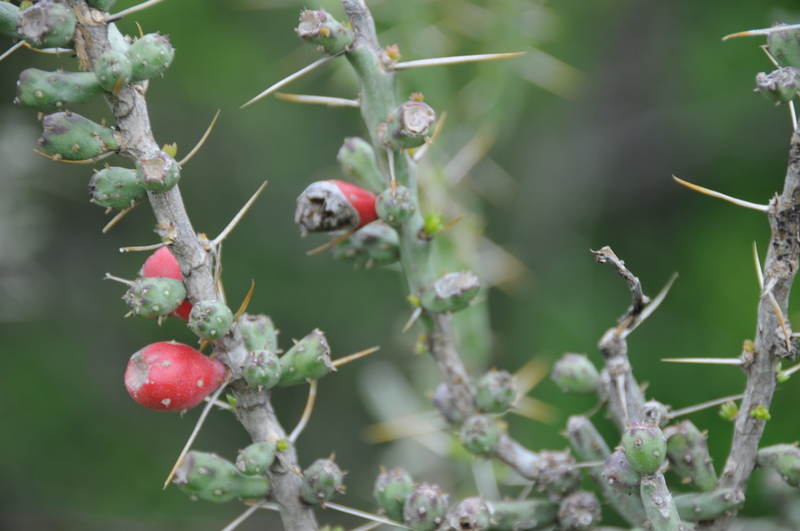 In the 1950s, I used to see and hear the burning of Prickly Pear thorns on ranches near San Saba and Lampasas, Texas. The sound the propane hand-held burners spewed was low-modulated, hollow–a raspy roar. Violent, unearthly. 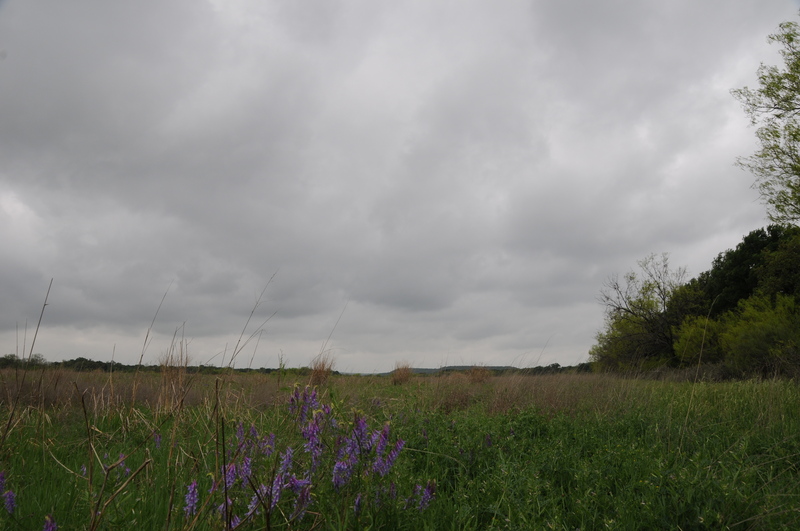 Uncommon sound, even for Texas, and you could hear the roar for miles around. It was rather disturbing, the sound, because it signified hard times and lack of rain upon the region as well as ghastly work for the crew performing the task. My uncle and cousin and their work crews would wear bandannas about their faces, shields from errant licks of flame and a filter from the smell of torched plants. After the toil of the day, blisters arose in bubbles upon parts of their hands and wrists. I never burned pear, for as a boy they made me stay in the shade. As my uncle and crew burned pear, they would first give the snakes and small animals time to flee from the burning. The reptiles and animals would, after an hour or so, circle back to their stands of cacti, their habitat singed, but not destroyed. The cattle would have emergency rations. And, we might all see another day, a chance for rain. No good feelings came out of burning Nopal. We all suffered when pear burned. Rain brought the good and allowed land and flesh to heal, and the coyote could use his tail for combing spines away–as legend would have it. Millions of people cook and eat the tender young pads of several species of prickly pear. Besides being more tender, immature pads have less oxalic acid, which could be toxic in large amounts. Nopales (the edible species of prickly pear and the harvested whole pads of the same) are very nutritious. Nopalitos (small pads that are cut into bite-size pieces) are mucilaginous like okra, and good for thickening broths. The mucilage also helps control blood-sugar levels associated with adult-onset diabetes. Diabetes is a common affliction among native Americans who adopt Western high-fat, low-fiber diets. There is also clinical evidence that nopales reduce blood cholesterol. Widely ignored by Anglos, who often regard them as worthless nuisances, opuntias are abundant and healthy foods for those who know how to use them. I’ve not the citations in front of me, but I remember the stories. 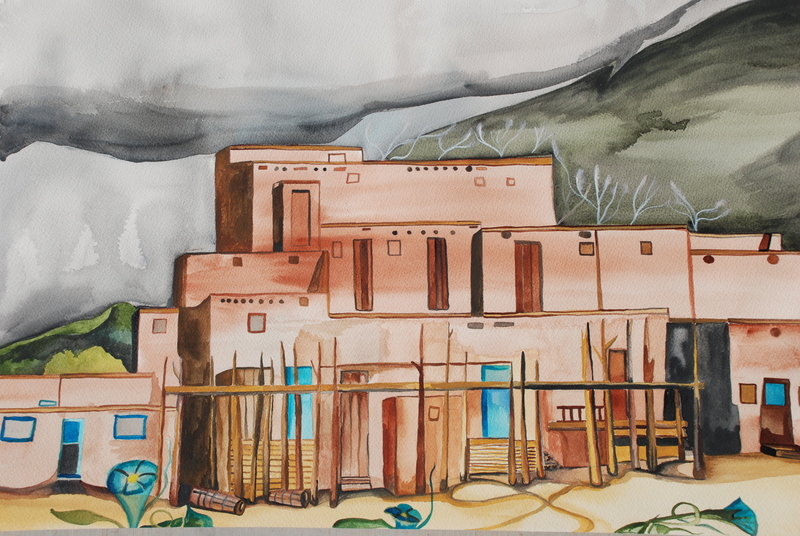 One is about the time that the elders of the Taos Pueblo talked over the possibility of bringing electricity into the heart of the pueblo, there on the plaza with the flowing stream between the two big houses. 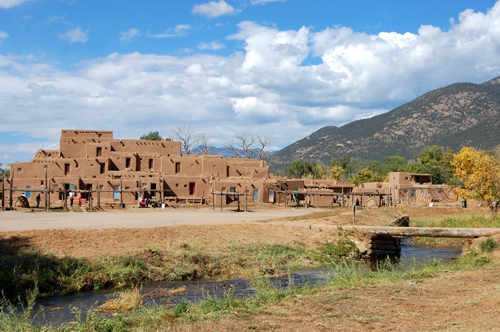 The Taos council decided not to allow electricity to be brought into the heart of the pueblo. Outside of the plaza, electricity could be brought into homes. The reasoning of the elders was that electricity brings with it appliances: refrigerators, toasters, radios and other machines. And, with those machines and gadgets, people would have to go to work, earn a living to buy those things to plug into electrical current. Introducing new technology would upset the balance within the community, taking people away from daily activities within the pueblo. Ceremonies would be forsaken–or, less important– because of the pressure to work to pay for machines to plug into electricity. Much would be lost and little gained. A simpler life would be complicated. A way would be lost, all by the introduction of electricity. And, so, electricity never came to the plaza. The plaza still remains the old way. The other narrative is somewhere in the Henry David Thoreau journals or maybe it was Walden. Thoreau proposed a distance race and a puzzle to his readers. Thoreau wrote that he could walk across Massachusetts faster than someone could take a train across the state. He could start walking immediately, live off the land, do an odd chore and meet people as he walked across the state. If one took the train, one had to buy a ticket. To buy a ticket, one had to have money and to get money, one had to work. So, before one could even board the train a whole sequence of things had to happen. And, then, you had to travel on the train’s schedule. To walk was faster, to travel the train was slower. 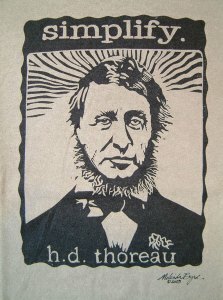 Race over, walking won, Thoreau wrote. These two stories illustrate the dependency and attachments that occur when technology enters our lives. I have some photos about plants, animals, terrain and fossils I would like to show you. There’s always a photo opportunity here on Flying Hat. April offers some comforting snapshots about the place. There’s a lot of communication taking place, even with horses and yucca. 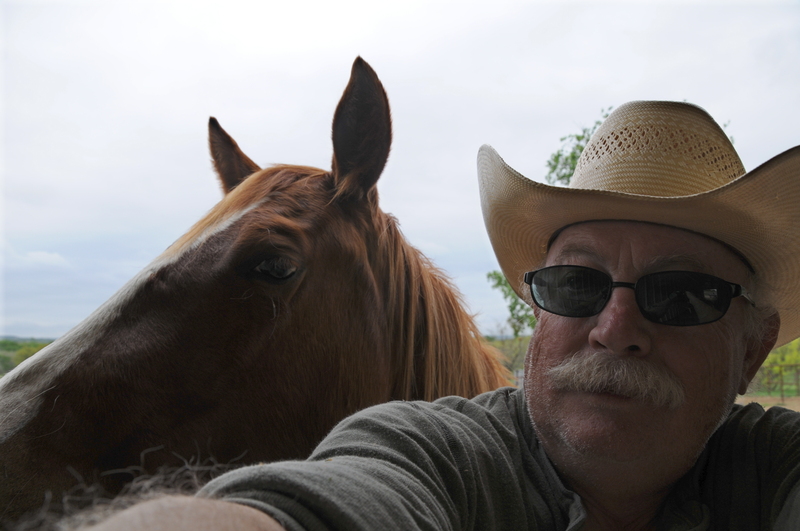 In “Fanny and Jack in the Stable Alleyway,” I am with Fanny and she wants to show her gratitude for the grain she got this morning. She sees the camera and wants to get her picture taken as well as give me a nuzzle in the neck. Fanny is not an aggressive horse. Nonetheless, around horses, a person must be cautious. They are flight animals and when frightened, they will kick or bolt forward. Fanny is a good mare and her trainer, Duncan Steele-Park and the crew at GCH Land & Cattle Co., have taken her good qualities and improved them. From the day of her birth, we have been familiar with Fanny, lifting her feet and touching her. 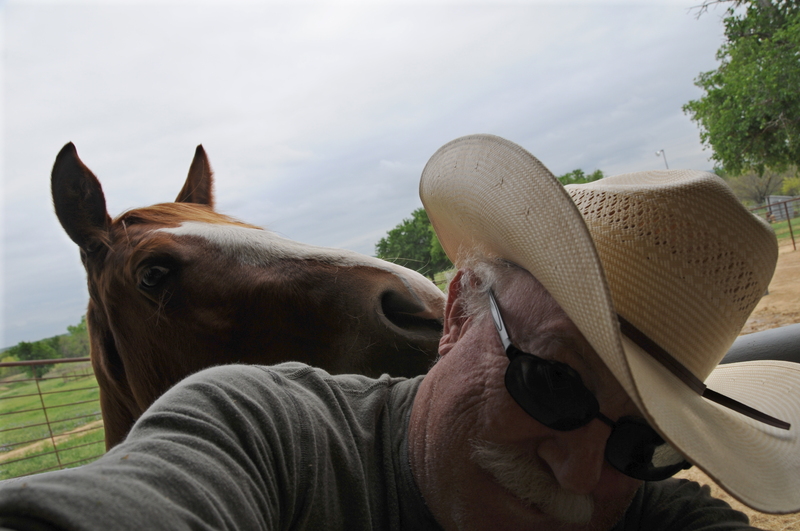 A nuzzle on the neck is good sign that the horse has “joined up” with a person. “Joining up” is a trademark term of Monty Roberts, The Man Who Listens to Horses (1996) and From My Hands to Yours (2002). Our horses have human contact–tactile contact–every day. The touching includes a “sacking out” with the hands. “Sacking out” is an term describing a procedure to rub the horse with a foreign object, i.e., a sack, halter, lead rope, blanket or with the hands. A daily touching and haltering with the horse boosts the familiarity between horse and human. In most cases, horses anticipate the tactile contact. 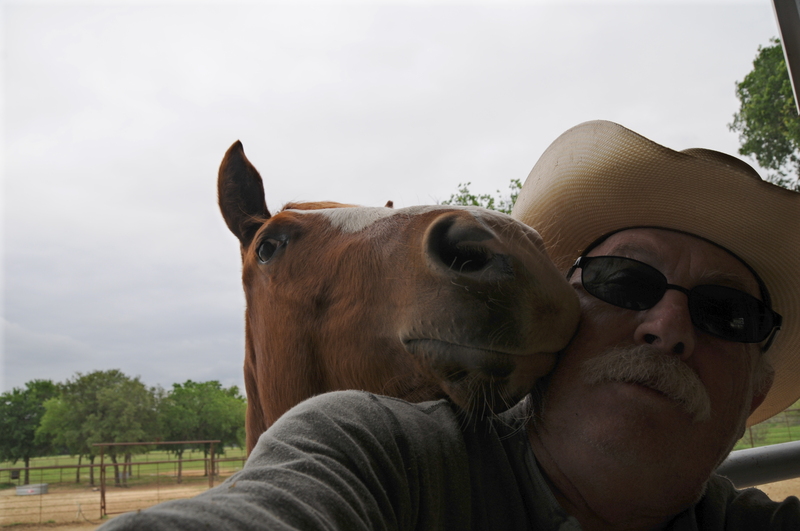 Lilly, our oldest mare, will glide up alongside us and stop, allowing us to rub her under her mane on the neck. The horse’s approach should not crowd the space of humans and it is best if they stop a few feet away and present themselves, more or less, with their flanks exposed. Even after a person becomes acquainted with equine behavior, it is always best to position the body at the flanks or broadside to the horse. The daily contact with horses is a good thing for them and us. We rub the horses once or twice between the eyes, a place they cannot see, as a sign we are trustworthy. I have spent thirty minutes typing this yucca plant. I may be wrong, but my factor analysis seems correct. It is a Pale-leaf yucca (Yucca pallida). As stated in my “Notice to Readers of Sage to Meadow,” if you discern an error in my typing this plant, please correct me. In my analysis, I also figured the yucca might be Yucca contricta (Buckley yucca) or Yucca necopina (Glen Rose yucca). In the next few days, these yuccas will blossom and I will provide field photos. I write so often about Poprock Hill, I thought I would provide a photo of the hill. This was taken earlier this April before the full eruption of grasses, but you can see the proliferation of verbena in the foreground. Notice also the abundance of Pale-leaf yucca (Yucca pallida) on the terraces below the ranch house. Poprock Hill is aptly named by local settlers because of the poprocks that are plentiful about the hill. I collect them, and with each rain poprocks emerge from the soil. “Poprocks on Silver” shows several poprocks, large and small, that I have collected. 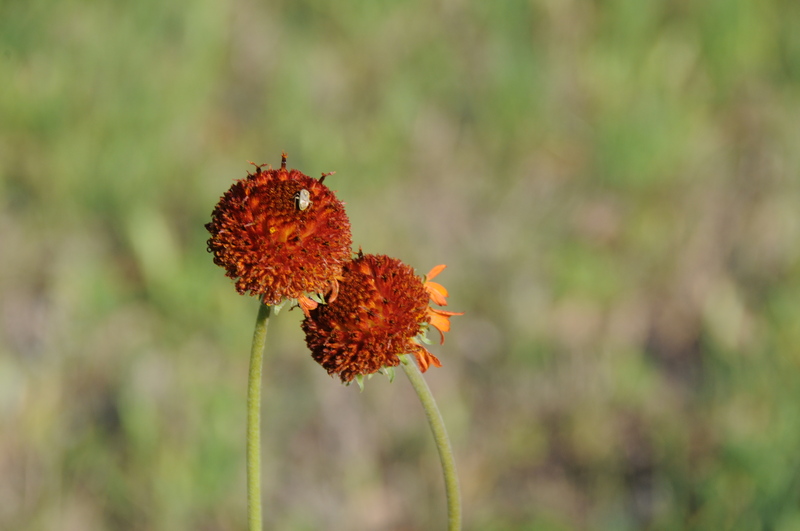 These photographs I have posted illustrate that even on simple, unglamorous land, there are natural items that are noteworthy and significant for study. The yucca plant I typed (hopefully, correct) required me to go back out to the terrace and look closer at the edges of the leaves to determine if there was a white line or if the leaves were curled, narrow or broad. As I began to type the yucca for posting, I got interested in the yucca for its own sake: what was it? Was it rare? Endemic? 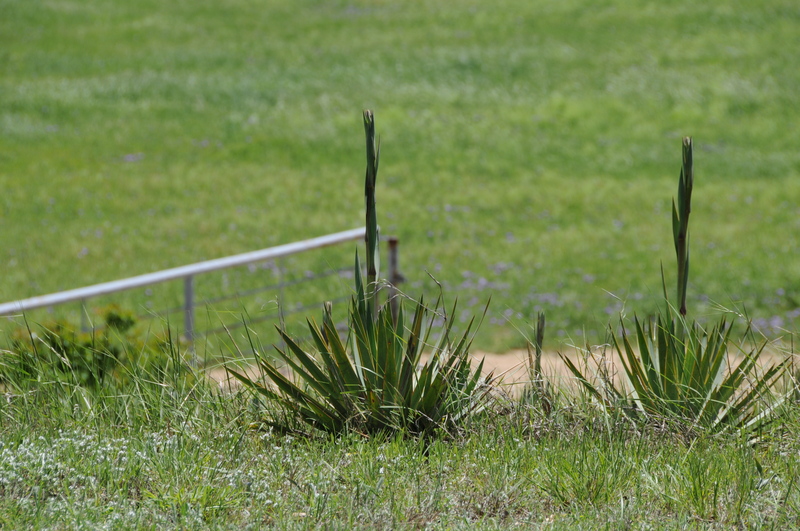 The Glen Rose yucca is a uncommon plant and needs some protection from extraction and destruction. Did I have a Glen Rose or not? I find the yucca in Texas worthy of further study. I may start a yucca farm. Finally, I think this post with photos shows how connections can be funny and personal between species. Fanny and I communicated and I think both of us got pleasure and companionship out of the contact. The yucca could not respond. Whoa there, cowboy! From a Native American point-of-view, the yucca and I were talking to each other, weren’t we? It showed me its style, color and emerging blossoms. I watched it and it “told” me what it was doing. Yes. Certain species of the yucca can be used for soap, shampoo. And, when I give Lilly her supplement for her osteoarthritis, the veterinary insisted that the supplement include yucca. This personalization of plants and animals is beneficial to us all: medicine, companionship and a unity that, however briefly, overcomes life’s estrangement. That’s talking with the plants and animals. Maybe they are our relatives. I wish you a pleasant week ahead: nuzzle your yucca, but be very careful. Like with all relatives. I don’t usually insert an article into the blog like this, but renewable and sustainable items like this I think are valuable. So, here it is. Smaller wind turbines provide renewable energy for homes, businesses » Abilene Reporter News. 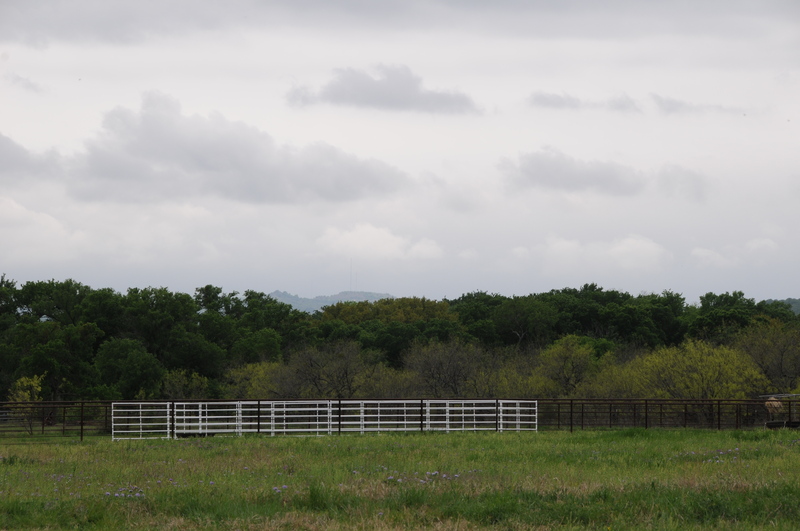 Wind farms supporting upward to 200 or more huge wind turbines on 200-foot towers are becoming rather commonplace across West Texas these days, but what about smaller wind energy solutions for the single farm or ranch? Joey Henderson, who is general manager of Porter Henderson Implement Co. with stores in San Angelo, Ballinger and Big Spring, observed the big gap between the large turbines and smaller units and decided to do something. The demonstrator unit installed at the Henderson home office, east of San Angelo, gives prospective buyers an idea what a small unit looks like. The Endurance Wind Turbine is a 5-kilowatt model on a 105-foot tower with three fiberglass blades on a induction generator. Henderson Wind Energy, a division of Porter Henderson Implement Co., has been in operation about a year and covers a territory made up of most of Texas and New Mexico, said Doran Reynold, wind specialist for the firm. Reynold said the small machines are not competition to large wind turbines. They serve different purposes. The large turbines harvest the wind and supply electricity for thousands of homes or businesses. The smaller units provide clean, renewable energy for a single farm or a home. 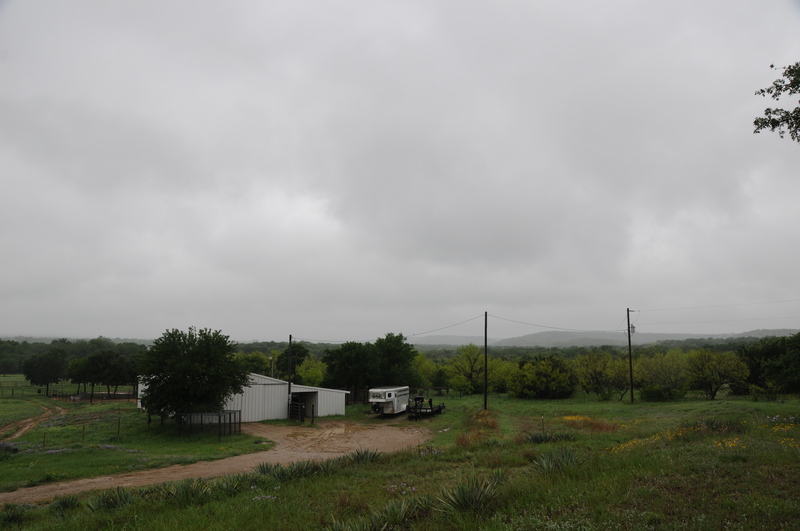 “We offer 5-kilowatt machines that are geared more for residential use, either in town — if a person lives in an area which is zoned for the 105-foot tower — or a farm or ranch home. But they are predominantly geared toward rural residential application,” Reynold said. The commercial towers extend up to 140 feet on the 50-kilowatt model, he said. When the blades are pointed straight to the sky, it adds another 10.5 feet to the height of the residential models and 29.5 feet to the commercial models. The whole movement these days is focused on more “green energy” and it works hand-and-hand with West Texas where there is a wind source that is mostly untapped, Reynolds said. Joey and Jeb Henderson represent the third generation to operate the West Texas John Deere dealership. Their grandfather, the late Porter Henderson Sr. became the sole owner in 1954 which was started in 1928 as Whitaker Brothers Implement. In 1989, a major expansion took place with the opening of John Deere Sales and Service Center in Ballinger. 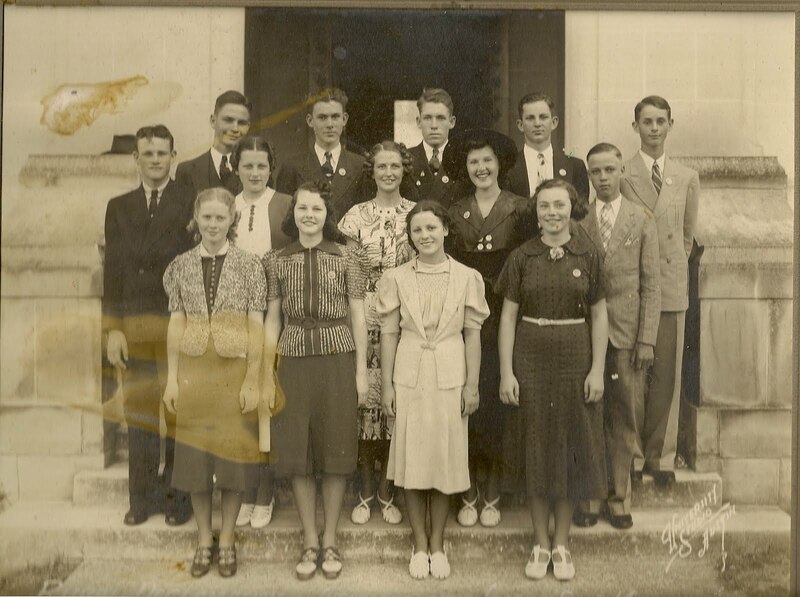 It is interesting to note that Porter Henderson Sr. managed Whitaker Brothers, the dealership in Ballinger, from 1934 to 1936. Porter Henderson Implement Co. added a third location in Big Spring in July 2001. Although chairman Joe Henderson Sr. still maintains “veto power,” the Henderson Brothers have give him no real need to use a veto. They have grown the family business at a steady pace by latching onto the latest space-age technology to compliment the John Deere legacy. In 2008, Porter Henderson introduced the Real Time Kinematics Network, the newest tool in precision farming. The main purpose of the RTK network is to correct signals which get distorted coming through the atmosphere from a satellite. The latest technology is also using satellite imaging to record where underground drip irrigation lines are located, so the farmer can plant cotton directly over the water source. For the Hendersons, harvesting the wild West Texas wind is yet another challenge to better serve farmers and ranchers. This was too good to pass up, especially for a horse lover like me. 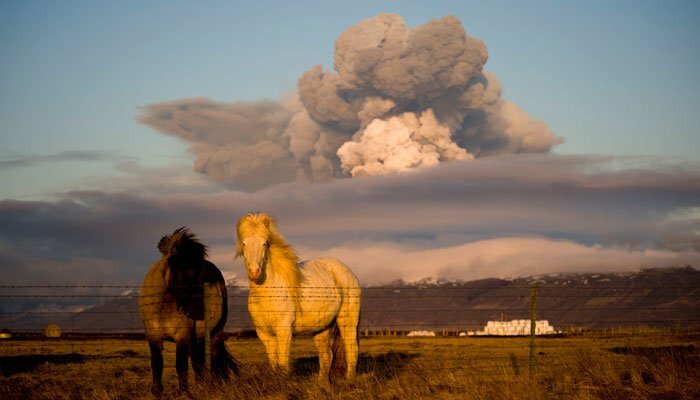 I can’t say that I would be so calm as to stand there with that big, black cloud coming. This photograph was by fdba, whatever that stands for. By way of citation, this came from the tag surfer on WordPress. Forward to focused field scan, April 18, 2010. Earlier today, I wrote that I sought fresh deer sign on our place. 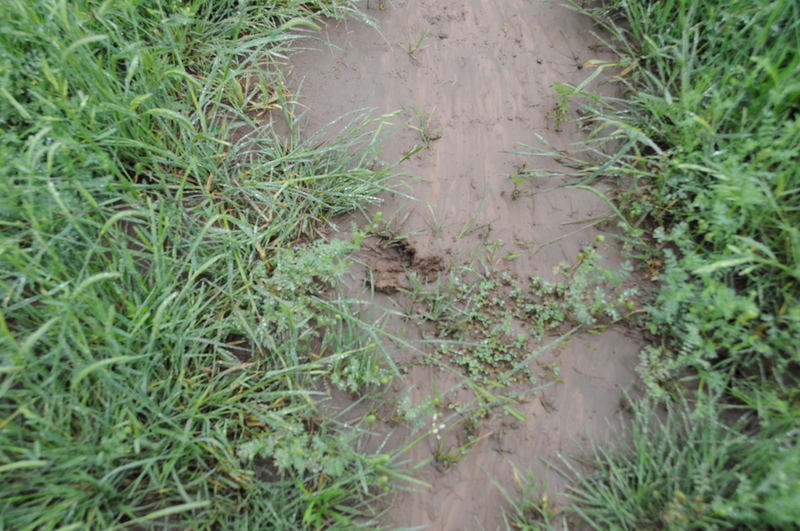 One month ago, I found one deer track near the salt lick: March 20, 2010. Since last month, I have found no fresh deer track and I know how to find track. This is not to say that no deer have passed through our place because that would require a more intense observation and scan pattern. And, besides, the deer may return if they have fled, as I suspect they have. 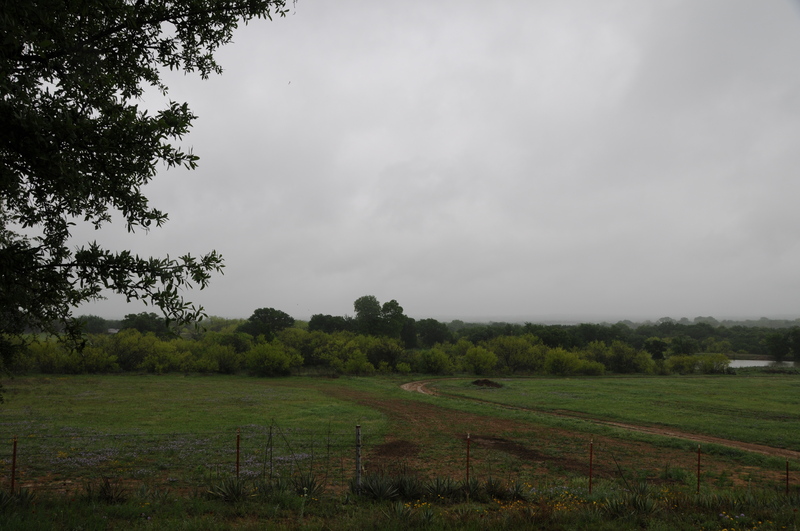 But before I give you my field report this afternoon (I will continue to scan the grove and pasture until dark obliterates my view), let me explain what was, what used to be, on our place. Photograph No. 1: This is a view from Poprock Hill, looking east. This photograph was taken on the terrace a few feet from our back porch. The deer used to browse in the mesquites on the edge of the pasture. The pasture on the other side of the mesquites is the Blue pasture, our neighbor to the east whose family has been here since the early twentieth century. There is a pond on the other side of the mesquite line and deer, when we moved here in 2003, would loaf most of the day around the pond and in the brush. The deer were predicable in browsing from left of the photograph to the right of the photograph. Our pond is seen on the right side of the photograph. In the late afternoon, the deer would pass in the distance, the herd numbering six to fifteen on any given day. 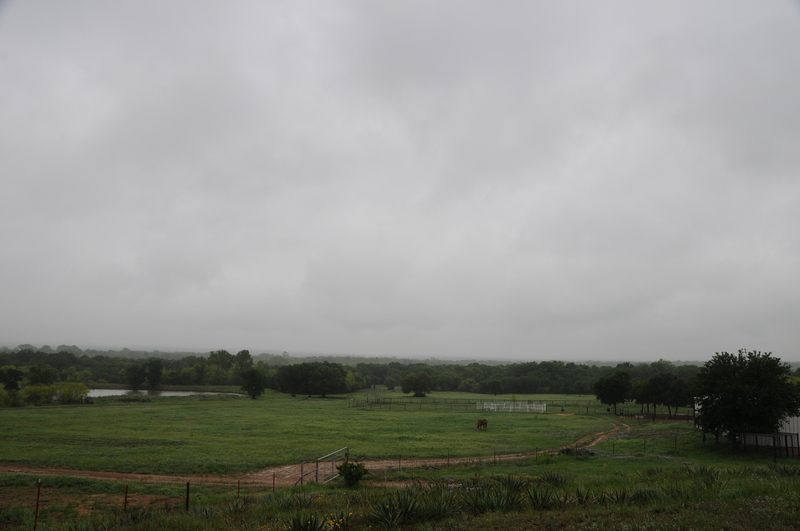 In 2008, a new set of neighbors set up residence beyond our pond and built a home, workshop, barn and corrals. Photograph No. 2 shows a view from our terrace, looking south, southeast. Deer would pass a few years ago back and forth into the brush. Photograph No. 3 shows the view to the southwest. The deer would browse into the grove beyond the barn, and, thence, towards the mountains in the distance. Not only have our neighbors constructed a new home, but they have cleared the brush on their place. 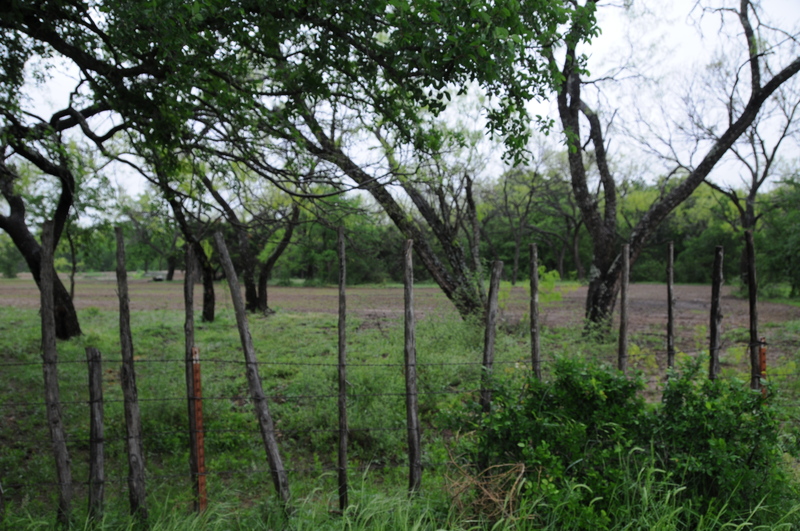 This is not unusual, as it is customary for homeowners to clear thickets and mesquite. Photograph No. 4 illustrates the acreage cleared in the last two years. Today, I set up a focused field scan for deer. I will continue today and into the early darkness for visuals of deer. The results of the focused field scan for deer on April 18, 2010. I found one deer print along the road into the grove. It was fresh track. 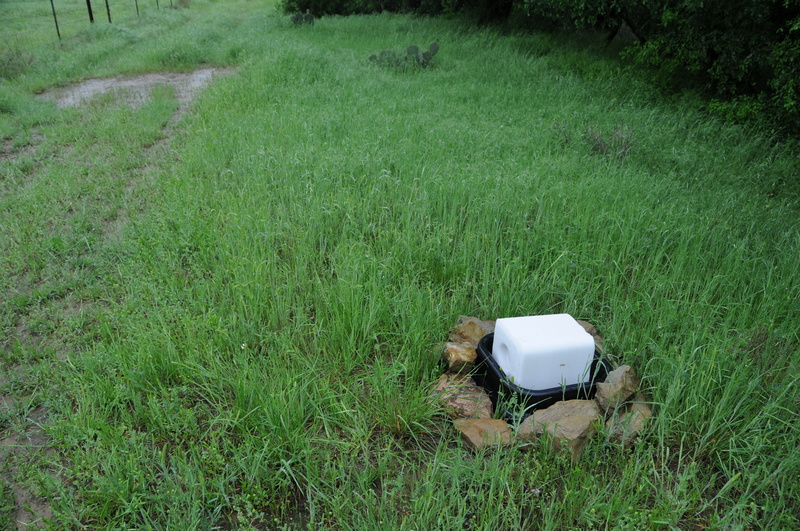 Near the salt lick, I found no track. In a sack this afternoon, I carried three quarts of corn to the salt lick. As I walked down the road to the salt lick, gunshots commenced on the Dooley place. Fortunately, since the last target-practice episode a few weeks ago, this firing of at least 100 rounds of two caliber of pistols or rifles stayed within the property lines of the Dooleys. They take care to be safe in their shooting practice. I scattered the corn near the salt lick. No deer sign. By the purity of Aristotelian logic, however, no deer sign is actually a Sign. And the reading of the Sign is not pleasant. It reads, thus: The deer population that migrated through the Blue, Hall, Dooley, Bryant and our properties has been erased. Since 2007, with the building of three homes in the immediate area (within a half-a-mile), the clearing of brush and the target practicing of young and energetic youth, our deer population, by my count and observations, has dwindled to one deer track from a high of fifteen animated, graceful creatures of grove and pasture that used to browse. Neither do I see fox anymore. Today, with the firing of shots, as I carried corn to the grove, crows cried Alarm! Alarm! and it was not my ambling that elicited the call, but the report of hot lead entering the good earth. The principle of using one’s property as one sees fit is a constant in our culture, and it is not my aim to dislodge that behavior from our country, and I think it futile to even suggest a small amendment to it, but rather my aim is raising the morality of good people to the ethics of wild nature that show us we are not alone, but that we inhabit and live upon land that is home to many creatures. I cannot stop my neighbors from alarming and scattering wildlife, and, most unfortunately, destroying the homes of animals and birds. I used to hear more and see more wild things here on Flying Hat. Now I hear and see less. It is still rich and enchanting, but much has been diminished since we have moved here. Between now (4:32 p.m.) and sundown, the darkness, I will look upon the pastures and seek the profile of the graceful deer. If I sight even One, I will come back to this post and log its appearance before I sleep tonight. I would not, if I were you, look for another entry to “Erasure of Deer” written on this post today. Or, possibly, ever. I have a focus for field activity today: scout on ranch and immediate surrounds for white-tailed deer. Last sign of track for deer was over a month ago and since then, noise and brush-clearing from adjacent development has occurred. All entries for Sage to Meadow will be as close to real time (RT) as possible. 7:05 a.m. CST: scan in grove and pasture for deer, daylight. No sighting. Seek track later today with corn distribution. No corn has been distributed for two weeks. Probability of finding deer track is minimal. 11:30 a.m., depart for general store for deer corn. 1:00 p.m., arrive back at ranch with two sacks of deer corn, $7.50 per sack. Rain and mist, 57 deg. F.
“That’s why I put the sacks in the cab when it rains,” I replied. The conversation was amiable, an exchange of information from two strangers, overcoming boredom on a rainy afternoon. Light mist this morning. Probably 0.20 inch of rain since yesterday. Lilly, Star and Fanny browse front pasture. Lilly shows age with slower gait and right back leg limp. Sweet Hija still at ESMS on Brazos. Shiney is at Jimmie Hardin’s in Aubrey, Texas, for ground training and conditioning for Triangle Sale, Shawnee, Oklahoma, June 5, 2010. Miss the little guy more than I thought I would. Pasture grasses are erupting well. Vetch in far field is waist-high in places. This week, Mourning Doves (Zenaidura macroura) are cooing. 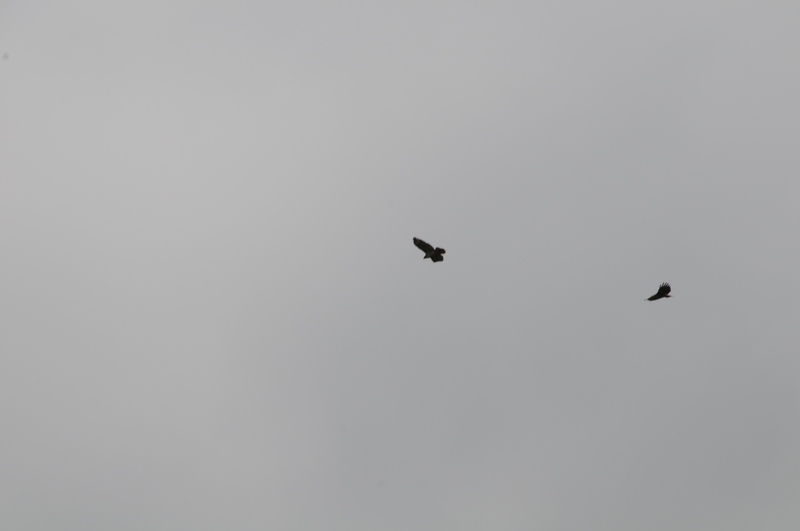 No calls before then, but noticed their presence. This morning the doves were ground feeding in the front yard. From Peterson: has a pointed tail, most widespread dove in the West. As to the call, Peterson says it is a “hollow mournful ooah, cooo, cooo, coo. At a distance only the three coo‘s are audible.” The color of the dove in our front yard was a reddish-gray with black spots. The two dove would ground feed a moment, then hunker down in the grass and loaf. I must have watched them for ten minutes and then had to come back to office and work on college Blackboard classes. I will have to focus on their call to hear the 00ah. I am practicing on imitating their call better. We have a larger dove that is whitish that appears in late summer. It is untyped. The two dove will perch on the power pole by the barn and watch me feed the horses. The following are some photographs I took this morning. These photographs were taken last week. Field grasses obscure pasture lanes. Minimum shredding planned this year, indicative of lower carbon footprint. 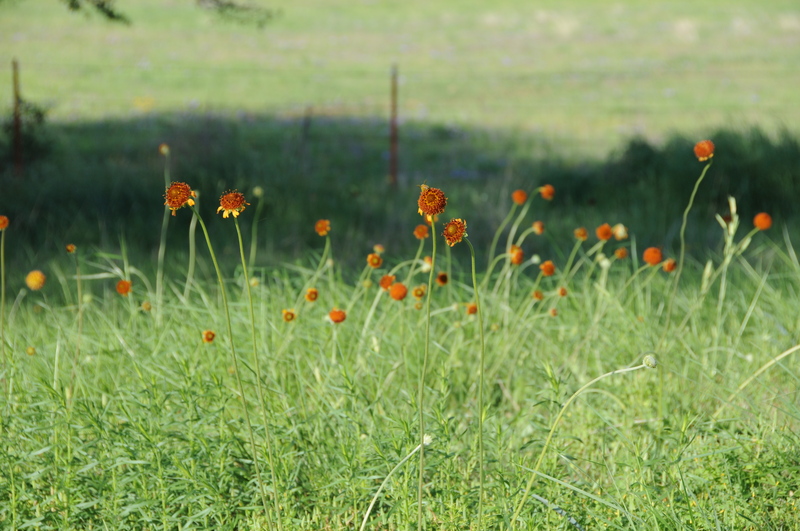 In addition, taller grasses can harbor wildlife. Hand cut mesquite brush this season, using clippers and large cutters. Lessen vehicle use in pastures. Lilly, Star and Fanny have browsed their way to the front pasture and are now standing close together, switching their tails to keep the flies away. They have all this space to lounge around in and they prefer to stand together with their bodies almost touching. Herd animals. I worry about Lilly during the night and have corralled her so she can avoid predators. One mountain lion sighting three months ago on SH 108 near Gibson place. I must get the duct tape down in the barn and duct tape my Peterson’s Field Guide. The binding is coming off.